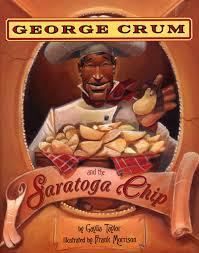 George Crum unknowingly invented the potato chip in 1853. As the Chef at the Moon Lake Lodge Resort in Saratoga Springs,New York,he was used to serving up plenty of french fries. That was until a very particular diner complained that the fries were too thick. Mr Crum made a few batches of thinner fries that the diner still thought were too thick. Finally, Mr. Crum set out to annoy this diner by making potato slices that were too thin to be eaten with a fork. The diner was not annoyed at all. In fact that person loved the thin potato slices that were served that day. They were originally called Saratoga Chips and potato crunches. William Tappendon orginaly manufactured and marketed the chips in Cleveland Ohio in 1895. In the 1920’s a young salesman named Herman Lay sold potato chips to the southern USA ( mostly from the trunk of his car). It was with the invention of the wax paper bag in 1926 that made potato chips even more popular. The potato chips had a longer shelf life and could withstand wider distribution. All for the love of a thinner french fry!! A new industry was born!! What is it your particular customers desire?